Colorado is becoming a battleground for wolf reintroduction. Ranching, farming and wildlife advocates on the Western Slope are launching Stop the Wolf Coalition to oppose a wolf reintroduction that is building momentum in Colorado. On Monday evening, the group is sponsoring a program on RFD-TV to present the case that wolves present a danger to humans, livestock, pets and wildlife. Richard Connell describes himself as the face of the Colorado Farm Bureau in western Colorado. His role has been in training and developing members to be advocates for agriculture and the issues they believe in. “Our goal is to educate the public on the real danger of bringing wolves back into this area,” Connell, who serves as secretary for the seven-member coalition board, said in an interview. Connell and others see wolf reintroduction groups gathering strength, mainly under the umbrella of the Rocky Mountain Wolf Project (RMWP). There are a number of subtleties involved with reintroducing wolves, but the coalition expects RMWP will launch a ballot measure to put wolf reintroduction to Colorado voters. Gray wolves have been reintroduced in Idaho, Montana and Wyoming, and in the south, Mexican gray wolves have been cultivated in New Mexico and Arizona. The northern wolf programs, started in the mid-1990s, have succeeded beyond expectations, and the species was delisted as endangered in 2011, which transferred management to the states. 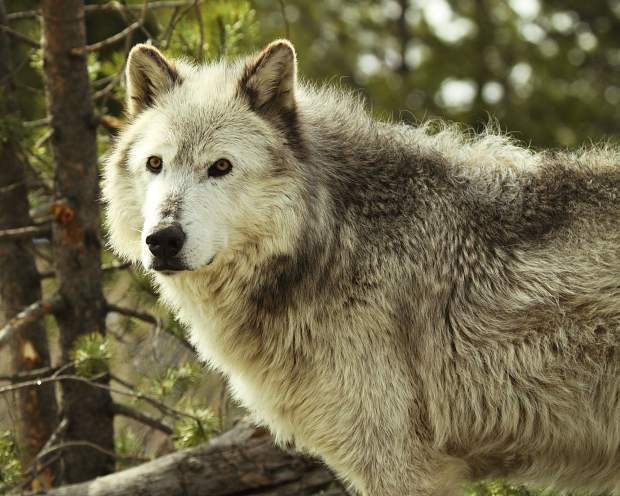 Mike Phillips, part of the Ted Turner Endangered Species Fund and a Montana state senator, has been out front of wolf reintroduction efforts for decades and wants to connect the wolf populations of the north and south by introducing packs in Colorado. “If Coloradans are willing to embrace an honest portrayal of the gray wolf, they will conclude that coexisting with them is a relatively straightforward affair that requires only a modicum of accommodation,” Phillips said in an interview. The Roaring Fork Valley has already been a battleground for the wolf reintroduction debate. Phillips was part of a contentious Carbondale meeting in February 2018 where ranching interests clashed with him over wolf reintroduction. Ranchers in areas the wolf has been introduced have documented deaths to livestock, but there are other dangers from wolves besides livestock loss, according to the Stop The Wolf Coalition. The RFD-TV program Monday will feature a panel of four professionals who have researched, and are opposed to wolf reintroduction. One of those is Valerius Geist, professor emeritus of Calgary University, who has documented cases of human death caused by wolves. The program will present the story of an Idaho woman who contracted hydatid disease after wolves were reintroduced. Wolves are known carriers of E. granulosus, a tapeworm that can be transferred to other canines and even humans, with deadly results. There will be a chance for viewers to call in to ask the panel questions, and a call for donations. “We are well aware that it’s not going to reach the whole world, but we think it’s important that the people of Kansas and Nebraska, eastern Colorado, be aware of our efforts,” Connell said. Phillips said he welcomes a fact-based debate about wolf reintroduction from ranchers, but he is confident those facts are on his side. Connell also said he wants a fact-based debate, and does not want to campaign against all wolves. The debate he wants to have is whether wolves are right for Colorado, and he wants people to be aware of the dangers they will bring. Colorado has very different demographics than the other areas wolves have been introduced, Connell said. The state has less than a third of the combined land area of Wyoming, Idaho and Montana, and more than double the amount of people, many who live in semi-rural areas. “Knowing the kind of people we have in Colorado who have fed bears, and fed other wildlife on their back porches, [wolves] will start learning the habits of people, and start wandering into backyards,” he said. “Those wolves will become habituated to our way of life. When they do, they watch us, they learn from us. Eventually, they will become bold enough to attack us,” he said. So far, Stop the Wolf consists of members of the Colorado Farm Bureau, sheep and cattle associations, and hunting groups. The Farm Bureau has not officially backed the coalition, but many county farm bureaus have individually supported the group. Connell also spoke to the Holy Cross Cattlemen’s Association meeting Saturday to present the work of Stop the Wolf. Ginny Harrington, membership chairman for Holy Cross Cattlemen’s, said the group has not made a decision on whether to join the coalition, though ranchers are interested in learning more of the facts about wolf reintroduction. Phillips believes that learning to coexist with wolves will improve humankind’s relationship to the planet, and awaken a spiritual respect for nature. Connell finds the dream of coexistence hubristic and antithetical to centuries of human history, and negative conceptions about the wolf have very real basis in human experience. “The other side discounts all the proverbs, stories and so on that humans have developed over centuries living with wolves,” Connell said. Eastern Europe is full of such stories, he said, and if people in America view the proverbs about wolves as mere folk tales it’s because the wolf has been eliminated from the region. Phillips sees restoring an apex predator to vast regions of the Rocky Mountains, from Canada to Mexico, as awakening a new paradigm of cooperation between humans and nature. “Symbols connect us one to another. Gray wolves can be a great symbol for imagining a new relationship with each other and with the climate,” Phillips said. “I am most motivated, over these last many decades, by promoting this whole thing of wolf restoration as a symbol for imagining a new, accommodating, more peaceful relationship with the wondrous diversity of life that we still see around us,” Phillips said.